The purging of the Muslim Brotherhood from Egyptian politics will not necessarily put the country on the path to secularism, as Sisi finds his own ways to use religion for political ends. Egypt's new President, Abdel Fattah El Sisi. Demotix/Emad Abdelrahman. All rights reserved. News that Egypt’s Ministry of Youth and Sports is preparing to launch a campaign against atheism was met with sarcasm and criticism on social media. Neamat Saty, the Youth Ministry’s director of civic education, and Ahmed Turk, the head of the Endowment Ministry’s mosques management unit, will work with a group of psychiatrists as a part of a national strategy to eradicate atheism. The move is not entirely surprising. In his speeches over recent months, President Abdel Fattah El Sisi has clearly adopted a religious discourse. Quoting the Quran and talking about the Day of Judgment in his interviews, Sisi wanted to make it clear that his image as a pious person is genuine and also show the people that he can provide an alternative to the Muslim Brotherhood. He also wanted to establish that religion would play a part in shaping the country’s ethics, and that state bodies will have a role in this. In one of his interviews, Sisi said that the president of the state is supposed to be responsible for everything in it – even its religion. Sisi’s discourse aimed to show that his knowledge of Islam surpasses Egyptians’ familiarity with religious rules; a tactic that has previously proved successful when used by politicians or media professionals. Public religious tendencies are reflected in the famous saying, “Egyptians are religious by nature.” Though many have criticised the statement, it is at least reflected in how people use religious statements in their everyday life. As posters reading “Did you praise the Prophet Muhammad (PBUH) today?” went viral on cars and in shops, the interior ministry said it plans to eliminate these posters immediately. The posters are believed to be circulated by the Al daawa al salafiya, affiliated with the Salafist al-Nour party. The interior ministry’s measures reflects how the government will not allow political forces to use religious slogans to win votes in the upcoming parliamentary elections. On the other hand, the ministry of youth campaign is not so much aimed at fighting atheism, as it is to giving the conservative public an example of how the country is not ‘fighting Islam’, as the Muslim Brotherhood puts it. The campaign against atheism shows how Sisi and his government believe that the threat of Islamists – whether allies like al-Nour party or opponents like the Muslim Brotherhood – is rather more imminent than other problems facing the country, such as increasing unemployment and discontent among the revolutionary youth, among other things. The current government hopes to end the deep polarisation in the country through giving “moderate religion” a bigger role in its policies, in order to win over the masses that had been drawn by the Brotherhood’s widespread social ventures. In his inauguration speech, Sisi urged Egyptians to work in order to protect and develop their rights and freedoms. Yet, in the first days for the new government, it became clear Sisi was not referring to political freedoms, as was made clear by jail sentences for activists like Alaa Abdel Fattah. While he used his cycling tour last week to talk about rebuilding the country and to urge Egyptians to save fuel, the image projected of the modern leader in sportswear was aimed at his not-so-conservative followers. 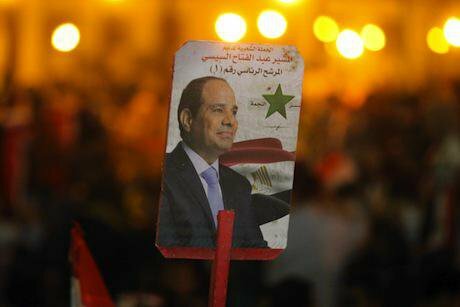 It is also highly unlikely that Sisi’s government will allow religious freedoms. The fight will not only target atheists, but could expand to restricting the freedoms of other minorities like Shi’ites and Baha’is. Problems will arise if Sisi cannot balance his quest to eliminate the Brotherhood’s influence and win the masses on the one hand, and his attempts to please his loyalists on the other. If he fails, the struggle between the feuding sides in Egypt will be the main obstacle facing affecting his other endeavours to rebuild the country.